There is a lot of confusion in the lay press and among the general public (and even some healthcare professionals) about the various levels of care and treatment options. People mistakenly assume that all individuals with addiction need inpatient detoxification services. The American Society of Addiction Medicine (ASAM) has a well validated tool, known as the ASAM Criteria, to determine the appropriate level of care for individuals seeking treatment for addiction. 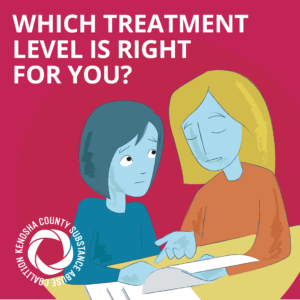 At what level of care should a person be receiving addiction treatment? David Mee-Lee, MD, was instrumental in developing the ASAM Criteria tool and has an educational program at the ASAM website (asam.org) that provides great insight toward understanding the ASAM Criteria. ASAM Criteria were initially developed in the 1980s but are not static and have changed quite a bit. For example, ASAM Criteria now include a level of care for medications to treat opioid addiction, which was not initially recognized as a separate level. Medications include buprenorphine, methadone, and injectable naltrexone. ASAM Criteria is both an assessment tool and a tool to determine what treatment is appropriate. It is important to realize that an individual’s treatment needs change throughout the course of the disease, and the treatment may require similar adjustment. Therefore, continually reassessment of patients is important. ASAM Criteria involves six dimensions for a multidimensional assessment. DIMENSION 1 considers the severity of withdrawal from a substance or intoxication with a substance. It is important to note that withdrawal management can be accomplished at various levels of care, from outpatient to acute medical inpatient hospitalization, depending on the substance involved and the risk associated with the withdrawal syndrome. The MOST INTENSIVE level of treatment for withdrawal management (Level 4) is Acute Inpatient Medically Managed Withdrawal that occurs in a full-fledged hospital that can provide multispecialty care and has access to emergency services (e.g., Ascension Wisconsin’s Inpatient Behavioral Health and Addiction Unit at All Saints in Racine). Level 4 withdrawal management is reserved for those with significant psychiatric or medical co-morbidities or for substance withdrawal syndromes that carry a high risk of death (alcohol withdrawal, sedative/hypnotic withdrawal, or any substance withdrawal with a severe complicating co-occurring medical [Dimension 2 of the ASAM Criteria] or psychiatric condition [Dimension 3 of the ASAM Criteria]). The LEAST INTENSIVE level of treatment for withdrawal management would be outpatient, office-based, withdrawal management for uncomplicated opioid withdrawal, cocaine, amphetamines, hallucinogens, and cannabis. Level 3 (Residential Withdrawal Services) includes residential facilities like Roger’s Memorial Hospital, the Dewey Center of Aurora Healthcare, NOVA, or the Gateway Foundation in Illinois, as well as therapeutic community facilities such as the Salvation Army, Teen Challenge, or Mount Zion House. Residential withdrawal management would be appropriate for those individuals who do not meet criteria for acute inpatient hospital withdrawal management but who require a controlled living environment, lack appropriate social support, or require removal from their usual living environment because it hampers their recovery. It is important to note that Wisconsin Medicaid DOES NOT currently pay for the room and board fees of residential treatment programs due to a federal restriction that requires a waiver from the federal government. Wisconsin is in the process of requesting that waiver. Partial hospitalization programs require intensive programming, generally about six hours per day, five to six days per week. Locally available programs include the Dual Partial Programs at Roger’s Memorial Hospital in Kenosha and Ascension Wisconsin All Saints in Racine. Intensive Outpatient Programs (IOPs) represent the most widely available level 2 outpatient treatment programs. Many IOPs have success rates as high as partial hospitalization or residential programs. Racine Behavioral Health, Ascension Wisconsin All Saints, Aurora Healthcare, and Roger’s Memorial Hospital in Kenosha all have IOPs. IOPs involve a combination of group therapy, psychoeducation, and individual therapy; some individuals do well while others require a higher level of care. Outpatient Treatment may be individual or group therapy, but it’s generally only one or two times per week. ASAM Criteria calls for the least restrictive effective setting for treatment, so, unless there’s physical medical evidence to the contrary, if a person hasn’t had previous failed attempts in treatment, the lowest level of care – outpatient treatment – will be indicated. Regardless of where the traditional treatment is provided, we need to overcome our stigma towards medications for addiction. While it is true that methadone and Suboxone are opioids, their use is linked with recovery from opioid use disorders (OUD). One model for us to consider is that of France, which experienced its opioid epidemic in the ’90s. The French government deregulated use of Suboxone to treat opioid use disorders, reducing mortality from opioid overdose 85% in five years. Medications are not a miracle, but they can be life-saving and life-changing for many individuals. Further, there is no evidence that medication should be stopped at some predetermined time. In the past, providers would treat with medications for six months or one year, then begin tapering, especially with Suboxone, because data was not available to support long-term use. However, more recent studies suggest that discontinuation of medication assisted treatment (MAT) leads to relapse in 80% of individuals within two years of discontinuation. As is the goal of any treatment, care should be taken to use the lowest effective dose. In other words, MAT should be tapered to the lowest dose that controls the disease of addiction. The above said, some patients have a better profile to consider a taper. For some individuals early in the course of addiction who have not developed significant permanent changes to the brain and who are able and willing to make the lifestyle changes that are needed to control the disease (similar to patients with diabetes who must change their lifestyles), taper after a shorter time may be feasible and appropriate. Such tapers must be individualized and discussed with the patients. Additionally, there are times when MAT must be discontinued; those decisions, too, must be discussed with the affected individuals. DIMENSION 2 takes into account the individual’s medical problems such as hypertension, diabetes, pancreatitis, liver function problems, heart problems, or any other condition that could cause complications during the withdrawal process or otherwise hamper recovery. Pregnancy is one criterion that qualifies for acute INPATIENT withdrawal management. Typically, however, uncomplicated opiate withdrawal is either accomplished as outpatient or residential withdrawal. It is important to remember that “detox” is not treatment and without additional treatment can actually increase the risk of overdose for an individual with an opioid use disorder. Evidence-based treatment strongly encourages medication assisted treatment (MAT) such that insurance companies are starting to deny funding if MAT is not being offered. DIMENSION 3 takes into account co-occurring psychiatric conditions such as psychosis, suicidal ideation, bipolar disorder, and schizophrenia. DIMENSIONS 4, 5, AND 6 all involve assessment of the patient’s social and environmental support structures and the patient’s own motivation for change. Treatment should be seen as a continuum of care, meaning that individuals can move up and down the continuum. Transitions of care should be seamless but can be hampered by fragmentation of the health care system, which is why partnerships between different organizations is critical – to allow for seamless transition across the continuum. In order for the treatment system to work, different healthcare entities need to stop seeing each other as competition and start working together to provide seamless care for the patient. It is important to realize that different health systems may provide complimentary, but not identical, healthcare services. Such cooperation between healthcare systems is crucial given that there is a significant workforce issue in Wisconsin; we currently lack ample psychiatry, addiction medicine, primary care, and psychotherapy services. A model similar to the wheel-and-spoke one from Vermont could work well here, provided we start working together to build stronger systems of care for those affected by the disease of addiction.